Do I have to sign-up for a Fan Account to download content from NoiseTrade? No, you can still simply enter your email address and postal code to download content from NoiseTrade. 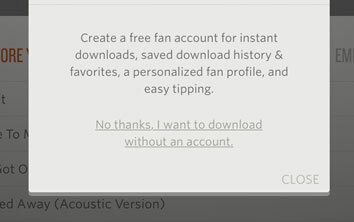 After choosing to download, click 'No thanks, I want to download without an account' at the bottom of the panel to use NoiseTrade the old fashioned way. How do I "favorite" an album? 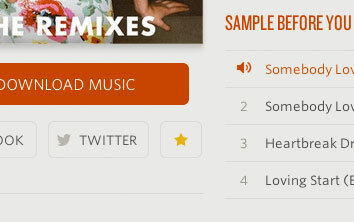 On every album or book page you'll see a star just to the right of the social sharing buttons below the cover. Clicking on the star will add that content to your favorites which will appear both in your Fan Account dashboard and on your public profile (unless you've chosen not to show your public profile). Does my profile have to be shown publicly? 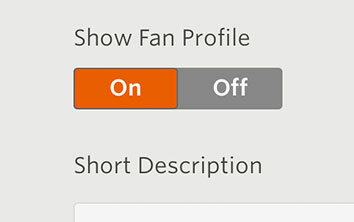 You can choose to hide your public profile by going to the 'Profile' tab in your Fan Account and switching 'Show Fan Profile' to off. Do I have to enter all of the profile information to use my Fan Account? The only information that's required is your email address and postal code, which we ask for when you're signing up (or get automatically if you sign-up via Facebook Connect). Do I have to add a saved credit card? No. If you wish you can simply enter your credit card or paypal information each time you tip an artist or author. NoiseTrade uses Stripe to save your credit card information, which is transferred over SSL and stored with 256-bit encryption. We are dedicated to the highest order of security and do not store any of your billing information locally. Is it possible to clear my download history? Your download history will keep track of all the content you download from NoiseTrade and cannot be edited. Can I permanently delete my Fan Account? Just contact us at Support and we are happy to destroy your account for you. IF YOU STILL HAVE QUESTIONS ABOUT FAN ACCOUNTS (OR ANYTHING ELSE), VISIT OUR HELP DESK.